The Mercedes-Benz #SocialReporter campaign caught my eye recently, not just because of the hashtag but due to its collaborative, interactive and very fun nature. Inviting users to upload various content (tweets, videos, Instagram photos, blog posts) in conjunction with an interactive Facebook site, the ultimate prizes are tickets to music, sports and fashion events. 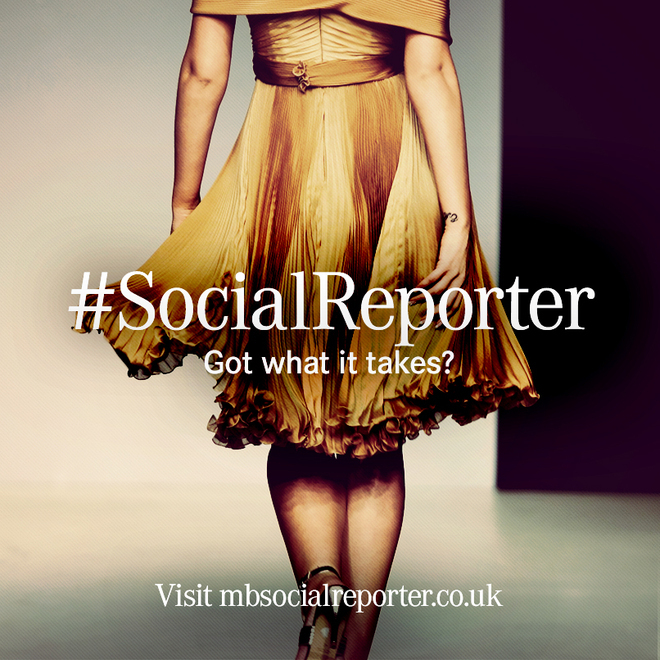 With a slick website, the #SocialReporter challenges you with the question, “Got what it takes?”. Well, who doesn’t want gain VIP access, the chance to interview celebrities and be the brand’s voice at exclusive events? By putting fans in the driving seat as the content creators, this is a step up from the two-way interactions between them and the brand, allowing them to gain exclusive experiences and being rewarded for their efforts from Mercedes-Benz; huge motivation right there. The campaign certainly highlights and taps into the ‘citizen journalism’ culture we are now so used to witnessing and being part of, plus it recognises the creativity of those within social media networks seeking to tell stories in their own unique and original ways. FANCY WINNING AN AMAZING FASHION EXPERIENCE? Currently the brand is running a competition to find the summer look of 2013. To enter, all you need to do is submit YOUR look – get out there, create and share your fashion moments which highlight your personality and reflect this summer’s vibes. As the winner you’ll be the #SocialReporter for Mercedes-Benz as part of an amazing fashion experience which includes attending shows while mingling with celebrities and VIPs, lunching with top bloggers, going to an exclusive fashion event plus interviewing Tanya Burr over lunch! As part of the prize, round trip travel to London, accommodation and a personal chauffeur are also included! So waste no time, decide on your look – what you wore to a festival, how you styled your favourite summer trend or a selfie of you looking summery – then upload to the Social Reporter site by 28th August. Make sure you follow on Twitter @MercedesBenzUK and like on Facebook too, it’d be rude not to!